Spring is finally here and we’ve been enjoying some warmer weather! While I do enjoy basking in the sunshine, I have actually enjoyed the long winter we’ve had and all of the snow. We had our first family holiday for several years this month and we chose to visit the mountains. We were very lucky still to be able to ski in April and had great conditions. I’ve gathered loads of pictures for scrapbooking and have even had them professionally printed. It makes a change to be able to actually pick up and look at the photos rather than just see them on a screen. I can’t wait to get these in a scrapbook and I think I will team them with some of my leftover Christmas stash with snowy scenes and snowflakes. 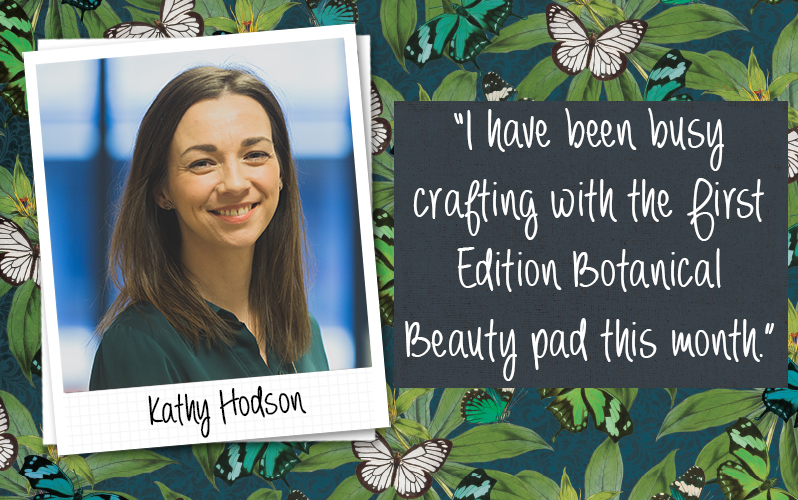 Crafting wise, I have been busy crafting with the First Edition Botanical Beauty pad this month. After I visited the Creativeworld craft fair in Frankfurt last year, I predicted that botanical, tropical and foliage themes would be big in craft as there was a lot of inspiration on display. I’m thrilled to say I was right and it shows no signs of disappearing. I’ve really enjoyed making my Botanical Beauty cards and I also made a succulent wreath. I love this trend so much I also purchased the First Edition washi tape tube in Kale, and have my eye on the Terrarium collection of tapes that have just launched. I have also been revisiting the Nature’s Grace and Bee Happy collections and the Wanderlust paper pad. They’re all adorable and I find it really easy to make great cards with them. The papers within the Nature’s Grace range are detailed enough to be the main focus of the card and I continue to be inspired by Bee Happy, coming up with new card layouts and designs. This Bee Happy themed card (above) is inspired by a card I saw on Instagram, made by Ruth Hamilton. Hers used the new Dovecraft Lost & Found collection which I will be starting to craft with next week. I’m so excited, I have so many ideas for this range! I promise to share some with you in my Craft Diary next month.